Turn your smoke detector into a smart smoke detector. Put a Roost battery inside and you’ll get alerts on your phone if the alarm goes off or the battery runs low. It’s like having a 24/7 notification system with an added bonus—no annoying, high-pitched alarm chirp. Roost also makes its own rugged detectors with the same smart battery inside. Trust one to monitor smoke, carbon monoxide, natural gas, or temperature dips that might lead to water damage. The water damage sensor is an industry leader in detecting leaks and low temperatures. If you live in a cold climate, an early alert can save you the costly repair of a burst or frozen pipe. The sensor also helps you track your home's humidity, which if too high, can let mold grow and cause health issues, too. Everything from Roost is geared to give you greater peace when minding your home, with greater convenience. Hi Grommet fans! I'm excited about introducing you to Roost Smart Home products. I work with our customers to help them be successful with our products and I'm here to answer any questions that you have. Very smart indeed. Great job! It's a good idea, but the price point makes it prohibitively expensive. I would have to spend $200 plus dollars to equip my smoke detectors with this option. $10 is the price point it needs to be at. Sadly this is typical with Grommet products. @Len thanks for your comment. I understand your concern about cost. For people who want to receive notification of hazards while away from their home, the Roost Smart Battery is an affordable option to retrofit existing alarms when compared to the cost of other "Smart Alarms" in the market which are closer to $100 per alarm. If your alarms are interconnected so that if one sounds they all sound, you can use one Roost battery. However, you won't have the added feature of being notified when your battery level is low in your alarms that do not have Roost Smart Batteries. Hi Len, technology like this may not come at the most affordable price point for all. It may not be something you roll out with all of your smoke detectors but one or two to start. We understand it may not be in the budget for all. That is the case with many new, innovative products. It comes at a price. With enough support, whether it be through purchasing or sharing with friends and family, you can help Roost and our other Makers grow so perhaps they can reduce the price at some point. @Mike Make them rechargeable and the price seems more reasonable. I see Grommet has decided to censor my comments. I guess only "happy thoughts" get posted. Good luck selling your item. It appears to be a good product and idea, however the pricing is not realistic for people on a budget. @Len Thanks for this follow-up comment. Please see my answer to your other post. Hi Len, not censoring, just up getting some water and not approving the comment immediately. See the answers Kim and I gave above. Will the battery work in a Carbon Monoxide detector as well as in a smoke detector? Is the Roost battery rechargeable? @Joseph the Roost battery is not rechargeable. After its 3-5 year life (depending on the alarm), you can buy a replacement power pack, currently priced at $9.99 directly from Roost. Does the battery work with all smoke detectors? Thank you. Hi Kim, so when I read that these batteries have a 5-7 year life, then you are saying that it isn't rechargeable, correct? So at the end of their use we just throw them away? No chance or recharging them and extending their usefulness and life or increasing the roi for these $30 batteries? @Gregory The Roost Smart Battery has a 3-5 year life depending on the alarm in which it is used. At the end of its life, you can replace the battery pack, currently priced at $9.99 directly from Roost. The Roost Smart Battery is an affordable option for retrofitting your existing smoke and smoke/CO alarms. Compare it to the price of other "Smart Alarms" in the market which are closer to $100 per alarm, plus you may need to pay for someone to install a new alarm. @Carol Yes, the Roost Smart Battery works in most smoke and smoke/CO alarms. If you have a specific alarm you'd like to ask about, please email [email protected] You can also check our Help Center at getroost.com/support, we have an article, "Are there any alarms that do not work with the Roost Smart Battery? " One question can my 85 yr old mother to understand is usage. @kevin Thanks for your comments! I don't know your mom, so can't really comment on that, but we do have many customers who install Roost Smart Home products in the homes of their elderly parents. Then, a son or daughter can monitor what is going on in their parents' home. For example, if an alarm sounds, and you are not at your parents' home, you'll be alerted on your smartphone. Our version 3 app supports multiple addresses in a clean and intuitive way, so you can have Roost Smart Products in your home and at other locations, including your parents' home, a second home, or a rental property. I was considering purchasing the 4 in 1 smart detector. I was wondering, and it is related to another question, in this forum .. is the battery in the 4 in 1 replaceable or rechargeable ? ?> OR is it replaced when needed and will cost an additional 30 dollars EACH time . @Ron our RSA-400 alarm comes with a Roost Smart Battery which will last 3-5 years in this alarm. After the battery is depleted, you can replace the battery's power pack. The power pack is currently priced at $9.99 and is available from Roost. The Roost Smart Battery is not rechargeable. @Ron The RSA-400 does not have a voice alert feature. The alarm itself makes the standard T3 and T4 signals required for smoke and CO, plus an alert for natural gas. The Smart Battery that comes with the alarm will allow you to receive these alarms on your smartphone. This is especially important when you are away from your home! I wonder if there's anything a hacker can do--probably set off your alarm, but it's not clear a hacker could access the LAN and computers. @E Douglas We've designed our products and entire Roost system with security in mind. To avoid hackers accessing our Smart Home Devices, our devices initiate all contact with the internet and the Roost Cloud. An external hacker cannot contact the device, or reach your network via Roost Smart Home devices. Thanks for all your questions about our Roost Smart Battery and our Smart Smoke Alarms. Don't miss our great Smart Water Leak and Freeze Detector. This product is a great way to have peace of mind in your home, helping you avoid the expense and hassle of a water emergency. In our state, smoke detectors must be wired together to sound alerts on all of them if one detects a potential fire. Will Roost detect a failing battery in one of the other connected detectors and send me an alert? @Steve Thanks for your question. The Roost Smart Battery can only detect the power level of itself, not other batteries in other alarms. Kim: If your existing detector is wired in to 110v, can you successfully install the Smart Battery so it will alert you even if it is running on household electricity? @A.C. Good question. 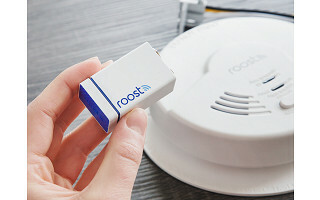 The Roost Smart Battery works in smoke/CO alarms that are connected to 120V AND smoke/CO alarms that are battery-only. The only requirement is that the alarm uses a 9V battery for back-up power or as its main power source. @Kim Thank you. I will be ordering. One more for you-water and freeze detector-What if the water is a rapid fill up-deluge-like flooding from a failed basement window. Will it send a signal through the water to what depth? @A.C. The Roost Smart Water Leak and Freeze Detector is water resistant, not water proof. It is highly sensitive, so even a small amount of water will trigger it to send an alarm. As long as the device can detect the onslaught of a flood, it will be able to send an initial alert to the Roost Cloud and you'll be notified on your smartphone. A large amount of water, like a flood, may damage the device, but it still should be able to get that first leak notification off to you! My dog did the Hot Dog thing like on the Farmers Insurance commercial last week. Luckily we got home shortly after, could smell it and hear the click of the stove. Had we been gone longer the house would have gone up with all my possessions and my 3 dogs. (Before the smoke detector went off. ) This is for me. Worth $30 plus the battery is good for 3 years! That makes it not that much more per year than a regular battery. @Alice I'm so glad you got home in time to prevent a fire disaster! This is why we've designed Roost Smart Home products - to give you notification of fire and water emergencies when you are away from home. Can they be sinc to more than one phone? @Gloria Once you connect a Roost Smart device to your Roost account (one phone), you can invite friends, family members and neighbors to monitor your devices. 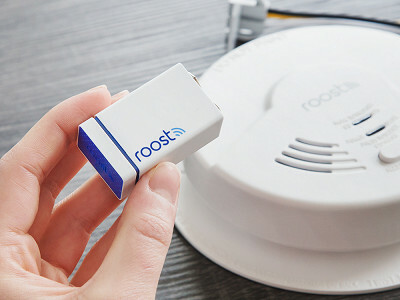 So even though the Roost Smart device is connected to your Wi-Fi and smartphone, many people can also receive alerts on their smartphones when an emergency happens. Is the 4-in-1 detector an actual explosive gas detector? Does it work with LP gas as well? @Rhonda The 4-in-1 detector detects smoke, fire, carbon monoxide, and natural gas. We do not detect LP (liquid propane) gas. @Kim How can it not if it is detecting natural gas? LP is a derivative of it, and both are hydrocarbons.How does it detect the natural gas then? Nearly all of the other detectors on the market detect explosive gas. @Rhonda Natural gas is different from LP. Our alarm is designed and certified to only detect natural gas, not propane. What are the trigger(s) that will activate this smart battery to send me an alert? A high pitched sound seems a likely one. Does this product have an API? Exactly how much power does the circuitry inside the battery itself use? 3-5 years expected lifetime seems very generous when considering an electronic circuit that utilizes wifi. The only way I can see that working is if it only makes a wifi connection when their is a problem to send me an alert. Otherwise the quiescent power usage would quickly deplete its capacity. I'd like to use your battery in Arduino based home security circuits I plan to build. So trying to dig deeper to see how hackable your device may be. @Anthony Thanks for your technical questions! The Roost Smart battery works by listening for the standard T3 and T4 alarm sounds from your smoke and smoke/CO alarms. We have a sophisticated alarm detection algorithm. We do not have a public API and the Roost Smart Battery is only designed (and warranted) for use in smoke, smoke/CO and CO alarms. Unlike your computer or smartphone, Roost Smart Devices are not connected to your Wi-Fi network 100% of the time. As you note, this would use up way too much power. 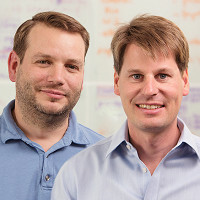 The devices "wake up" when they hear an alarm, connect to your Wi-Fi, and the Roost Cloud. Then we send you alerts. I'm sure there are a lot of hackers that could find many uses for your product. A public API would be most helpful to many. Maybe in the future you could consider a more hackable version with a lipoly battery also. In my opinion at $30 it's a little steep but not too bad. @Kim That on-demand Wi-Fi connection should help protect against hackers from accessing your LAN. @E Douglas Thanks for your comment. We don't have an on-demand Wi-Fi connection. The device itself controls when it accesses Wi-Fi and the Roost Cloud. Thanks again for all your questions! Great to see the excitement about Roost Smart Home devices. Please remember to check out our Smart Water Leak and Freeze Detector. According to Home Advisor homeowners can spend between $45o and $6,000 to repair damage from a water leak. The average cost of a water leak is $2,277. Our affordable leak detector can help you avoid those large repair costs! Wait! Is it 9.99 or 29.95? I tried to buy it. "@Joseph the Roost battery is not rechargeable. After its 3-5 year life (depending on the alarm), you can buy a replacement power pack, currently priced at $9.99 directly from Roost." @Rex The complete Roost Smart Battery is $29.95. A replacement battery pack, which will only work to replace part of the original battery, is $9.99 directly from Roost. Turn your smoke detector into a smart smoke detector. Put a Roost battery inside and you’ll get alerts on your phone if the alarm goes off or the battery runs low. It’s like having a 24/7 notification system with an added bonus—no annoying, high-pitched alarm chirp. Roost also makes its own rugged detectors with the same smart battery inside. Trust one to monitor smoke, carbon monoxide, natural gas, or temperature dips that might lead to water damage. The water damage sensor is an industry leader in detecting leaks and low temperatures. If you live in a cold climate, an early alert can save you the costly repair of a burst or frozen pipe. The sensor also helps you track your home's humidity, which if too high, can let mold grow and cause health issues, too.